Join us Saturday, November 4th as fight night returns to Mason Inn for UFC 217 - get your tickets NOW! 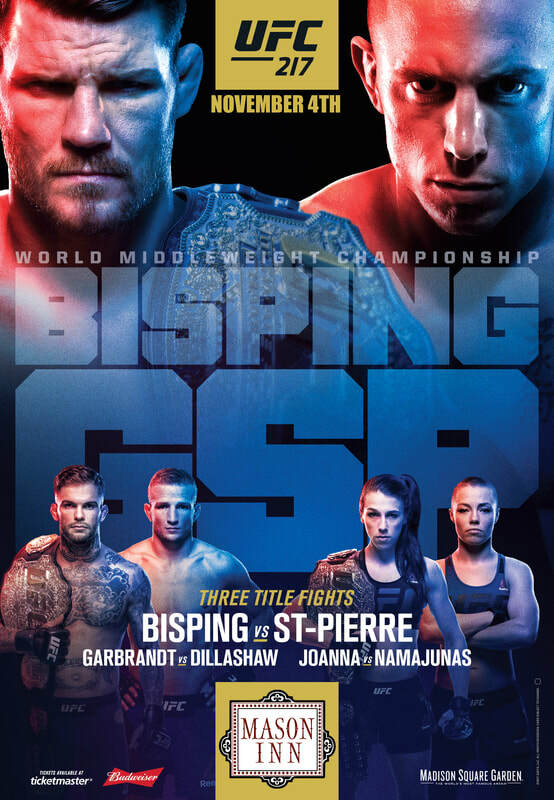 We've got a lineup of 3 TITLE FIGHTS guaranteed to make this an action-packed night! Our bar is equipped with 9 large-screen TVs and a 100-inch projection screen, so there's no way you'll miss a second of the action! The 4th will be a 21+ ticket-only event with beer, wine & spirits available for purchase at the bar. No matter the size of your party, we can accommodate! Have a larger party? Contact us below to inquire about larger parties. Purchasing tickets ahead of time is recommended as there is no guarantee tickets will be sold at the door. Party Larger than 6? Contact Us now to reserve your spot!